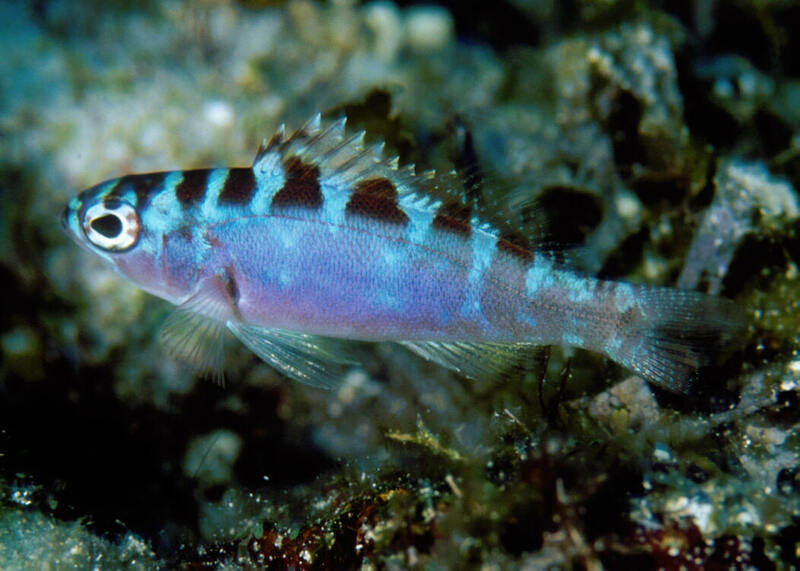 Serranus psittacinus Valenciennes 1846 (S. fasciatus (Jenyns 1840) is a common synonym. The Barred Serrano. Eastern Pacific; Sea of Cortez to Chile, including Galapagos. To seven inches in length. Here in Puerto Vallarta. 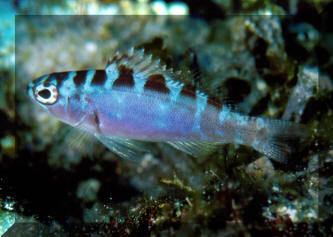 Serranus tortugarum Longley 1935, the Chalk Bass. Tropical west Atlantic. To three inches in length. Cozumel pic. Dascyllus flavicaudus Randall & Allen 1977, the Yellowtail Damsel. Southeastern central Pacific. To five inches in length. Found around rock and coral reefs. A juv. in Fr. Polynesia 2018. Dascyllus strasburgi Klausewitz 1960, Strasburg's Dascyllus. 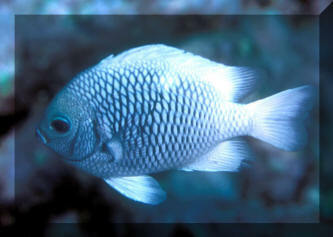 Found only in the south central Pacific Islands called the Marquesas on coral and rocky reefs. To three and a half inches in length. Nuka Hiva, Marquesas, Polynesia pic of an adult (juveniles are identical to D. trimaculatus, usually found in association with Cryptodendron anemones).